Do you have a back up plan? No, not the kind where you and your bestie pinky-swear that if neither of you is married by the age of 40 you’ll marry each other. I’m referring to the more attainable kind where you protect your images from becoming trapped in the cellulose nether reaches of a fried and nonfunctional hard drive. External hard drives are relatively inexpensive (I just bought a fast, brand name, 3 terabyte drive for $200 yesterday), and are easy to install. Just plug them in and voila(!) extra storage or back up ready to use. So there is really no excuse for not doing this. The Cloud is still a little too esoteric for a lot of folks to truly embrace. A mystical area in cyberspace where all of your files are redundantly kept in case of a catastrophe. My biggest issue with it would be the overage fees from my service provider for uploading terabyte upon terabyte of information. 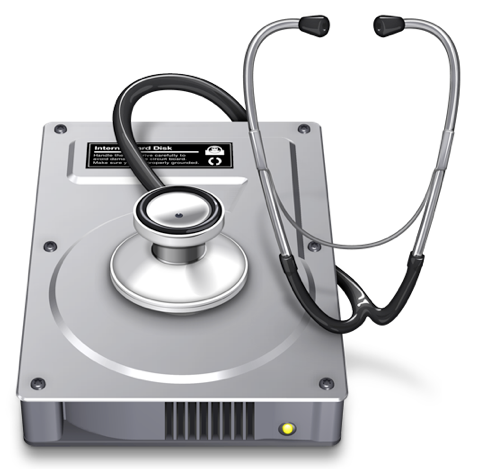 CD/DVD for back up is becoming less and less viable with the larger megapixel (i.e. larger file sizes) cameras of today. You can only fit so much on to each one, which makes cataloging a chore. Memory Cards are a simple alternative to having to back up at all. Although I don’t recommend it, I know people that buy inexpensive memory cards then simply keep them as their back up after they have downloaded the images to their computer. …On the back of your camera… AKA: Your LCD screen! 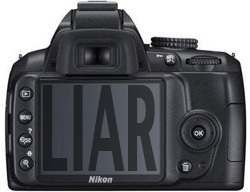 This applies to all camera LCD screens, not just Nikon. Please don't sue me. First of all, I recommend shooting in RAW and developing in Lightroom to just about every student that takes one (or more) of my classes at Henry’s School of Imaging. The amount of information that is retained in a RAW file is staggering in comparison to the alternative; jpg. The other night I had a comment from a student who had attempted to shoot RAW when they first purchased their camera, but promptly switched back to jpg. They complained that when they first took the picture, it looked amazing on their camera’s screen, but when they imported said picture into Lightroom, it suddenly changed and became bland and boring, leaving them with their work cut out for them when developing their image. The reason this happens is that with every RAW image you capture, a jpg preview is created along with it. This jpg preview has the same processing that the camera would have normally applied, as if you were shooting in jpg to begin with. The reasoning behind this is so that you can preview your RAW images using any number of programs, even though they can’t necessarily edit the raw data. For instance, on a Mac, you can see your RAW images using Preview, even though you can’t actually edit them using that program. Think of it as a large thumbnail preview. Simply put, you should always try and get the exposure right in camera; even (especially) when shooting RAW images. How do you do this effectively? By using your histogram, of course. The moral of the story? Your LCD screen is a compulsive liar and can’t be trusted, but the histogram never lies! Granted, I’ve only been playing with it for a couple of hours, but I think can safely say that the upgrades are not only plentiful, but amazingly intuitive. And I don’t take well to change! The “re-jigging” of some of the sliders actually came very naturally to me. Apparently it was what I always wanted, without knowing that I wanted it. The biggest improvement that most people will see, however, is the value. 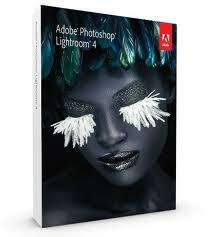 Adobe has cut the price in half for a full version of Lr4, which is insane for this caliber of software. Books can only be published through “Blurb” (or to a .pdf file), although Adobe has said they did their due diligence in choosing them as their provider. All in all, very minor complaints for all the improvements that Adobe served up. Kudos! A lot can be said about HDR Photography, good and bad. If done properly, it can elevate an image from ordinary to extraordinary. 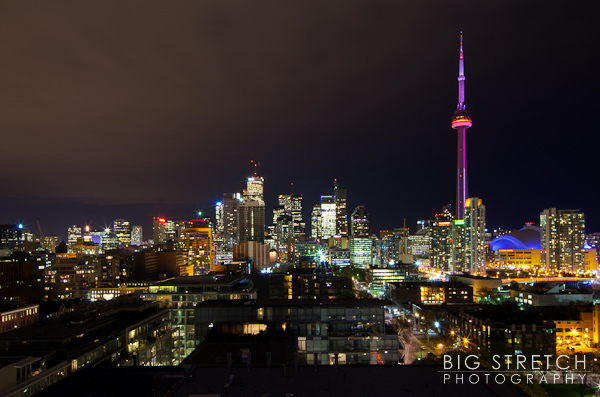 The problem is, too many photographers get caught up in what is considered “the HDR look”. IMHO, a good HDR image shouldn’t really stand out as an HDR image at all. It shouldn’t jump out and slap you in the face and scream “I’m HDR, Beeatch!” Of course there are exceptions to every rule, and I have seen some fantastic images that employ the often heavy-handed use of HDR. However, technically speaking, HDR stands for High Dynamic Range, which means that your image has good tonal value throughout, from shadow detail to highlights. Take the following image for example (click for a sharper look): This was taken on a tripod with a 1/8 of a second Shutter Speed @ f16 (to get everything sharp from foreground to background) with exposure compensation set to -0.7. Not bad, right? 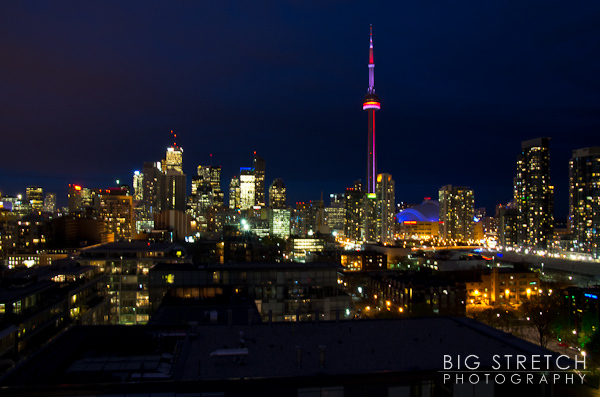 But now let’s compare it to the image below (again, click for a sharper look): Compare the sky in these two images and buildings at the bottom of the CN Tower. This image is a combination of 5 different bracketed images (-2.0 | -1.0 | 0 | +1.0 | +2.0) that I then blended/enfused using a great donationware plug-in for Adobe Lightroom called LR/Enfuse. Doesn’t look like your typical HDR shot, does it? But the tonal range is there, giving it a nice subtle punch that you wouldn’t be able to get with a single shot. I find that this style of HDR suits my taste more than the heavy-handed style that is prevalent right now. But hey, that’s just my two cents. Besides, I’m too cheap to fork out the $99 for Photomatix (arguable the most popular HDR Software on the market today). To kick things off here at the new Big Stretch Photography Blog, I’m going to talk about the importance of your camera’s firmware, something that most amateur photographers that I teach have no clue about. So, what’s Firmware, you might rightfully ask? Well, it’s basically your camera’s Operating System. No camera is perfect (I look forward to your angry comments/emails), so as bugs are discovered in almost all camera models (not literally, but they can be just as annoying) the manufacturer will release a software, or firmware update to correct for said bugs. But they don’t stop at simply fixing issues. Via your camera’s firmware, they can also add features and functionality to your camera. For instance, with the second firmware release for one of my cameras, the Pentax K5, the manufacturer actually increased my FPS (frames per second) when shooting in RAW from 7 to 8 FPS. Tres cool, no? When it comes to checking which firmware version is currently loaded on your camera, every manufacturer does it a little differently, so check your camera manual’s index or table of contents for the word firmware to see where you can find it on your camera. Once you’ve found out which version is currently loaded on your camera, a quick google search like: “Canon (your model) firmware” should result in a direct link to the manufacturer’s website right up near the top of the results. I strongly recommend downloading it from the manufacturer’s official website. Others may offer it for download, but it’s better to be safe than sorry, IMHO. You need only download the latest version of the firmware, as that will have all previous updates integrated into it. Once you download and unzip it, there will be a “read me” file included that will guide you through the process of updating your camera’s firmware. Again, this varies among manufacturers. Just make sure you have a fully charged battery in your camera before you start. The update usually doesn’t take long, but if your battery dies during the update process you could end up with a very expensive paperweight, and we certainly don’t want that. It’s actually quite easy to do, and you never know, something that might have been annoying you about your camera may have simply been a bug… A bug that has since been fixed, via firmware.